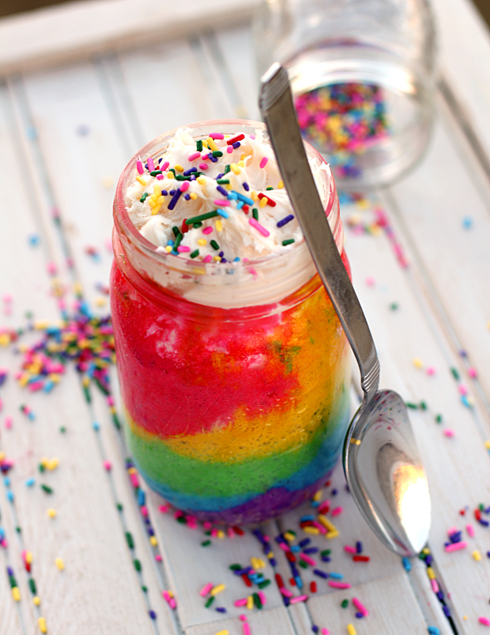 I’m obviously awarding cool points to the people at Babble for putting a cake in a mason jar, but make it a rainbow cake and those points multiply to infinity. Is this not the best idea ever? They’ve done this with other types of cake as well and it’s equally as darling. I cannot wait to bake me a cake as fast as I can. Thanks to Modern Parents Messy Kids for the find! This entry was posted in idea thief and tagged babble mason jar cake, cake in a mason jar, how to bake a cake in a jar, how to make a rainbow cake, kid birthday cake idea, rainbow cake, unique cake by Annika. Bookmark the permalink. super fun…good for a tye-dye look as well. Pingback: Masons Galore! « Your Cake & Eat it Too!